Seafood has been a decades-long love affair here in Southwest Florida. The Boathouse on Naples Bay, overlooking the glistening waters in historic Downtown Naples at the City Dock, has mastered this love affair. Wrapped in floor-to-ceiling windows, with seating indoors and out, the Boathouse on Naples Bay offers unprecedented views and a wonderful, yet unpretentious atmosphere. 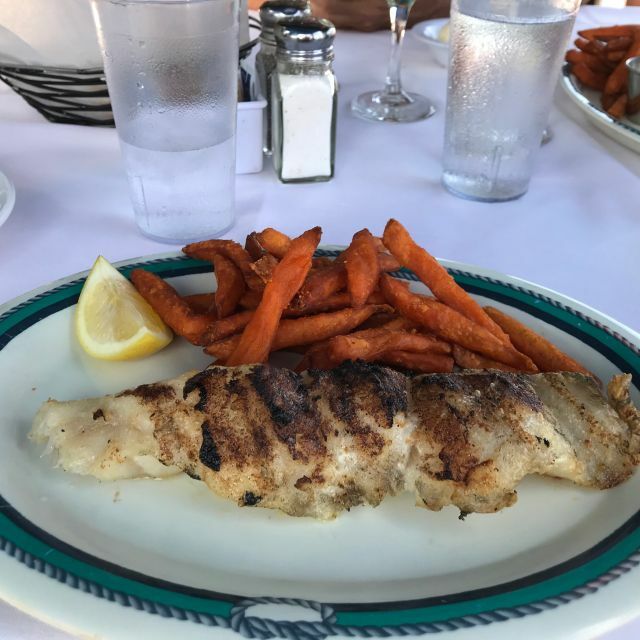 We prepare the abundance of just-caught fish and seafood, flown in daily. 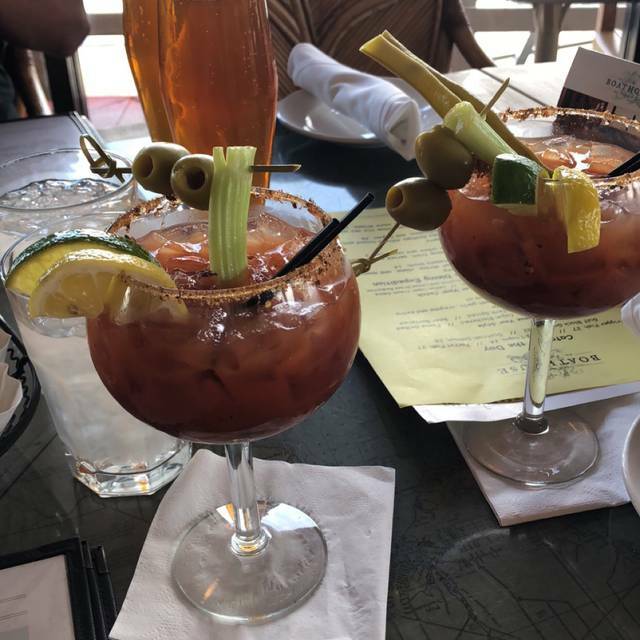 Our menu also offers premium Midwestern beef and poultry, Old World pasta dishes, crisp, garden fresh salads, hardy sandwiches, succulent burgers, and innovative daily specials and a surprisingly affordable wine list. The waterfront ambiance of the Boathouse on Naples Bay is as enticing as the food and at the heart of Naples’ history. Spectacular views, great food, friendly, seasoned staff and a very relaxed attitude. Welcome to the Boathouse on Naples Bay. Made with your favorite liquor, draft beer, or just by itself. Champagne and your choice of Pama pomegranate liqueur or fresh-squeezed orange juice. Blue Vodka, Peach Tree Schnapps, lemonade, splash of Sprite. Garden fresh mushrooms, onions, sprouts, kale, carrot, cabbage and choice of cheese. Gorgeous ripe tomato, fresh spinach, fragrant basil pesto and mozzarella cheese. Andouille sausage, chili, charred tomato salsa and pepper jack cheese. Country ham, crisp bacon, bell pepper, onion, smoked gouda and cheddar. Decadent artichokes, fresh spinach, ripe tomato, capers, olives and feta cheese. Smoked wahoo and salmon with freshly diced tomato, green onions, spinach, zucchini , and yellow squash. Perfectly baked with onion and Swiss and cheddar cheeses. Served with soft-boiled egg, perfectly crisp bacon, spinach and dusting of parmesan cheese. Fluffy and piled high, topped with candied pecans, rum butter and rich maple syrup. Sprinkled with dried fruit, rich vanilla crème anglaise and rich maple syrup. Decadent artichokes, fresh spinach, ripe tomatoes, onions, capers, olives and golden brown seasoned potatoes. Grilled 6 oz. steak over sautéed spinach with three eggs, poached, scrambled or sunny side up. Viva Happy Hour!! Two for One Margaritas, Corona and Corona Light ALL DAY Saturday and Sunday!! Featuring Authentic Mexican dishes for lunch and dinner specials. Regular menu available as well. Happy Cinco de Mayo!! Hoppy Easter Everybunny!! Follow the bunny, he is going to Boathouse! Very egg-cited about Boathouse's Crackin' Brunch from 10am-2pm! Also we will featuring all day our Fresh Catch selection and a Braised Lamb Shank served with a tomato ragu on a bed of linguini! Regular menu available too!! Great service and food! Our waiter Joe was friendly and attentive. Delicious surf and turf! Would definitely go again. Very good food, it’s too bad we got a server that was below average. When a guest was asked what they wanted for sides, our guest asked what are the options. The server said”didn’t you read the menu? Nobody reads the menu anymore unless it’s on their phone.” Our guest is 83 years old, the server was rude and seemed to be rushing not wanting to spend time at the table. Great service. The waitress recommended splitting an entrée between two of us and it was well executed. Service was more casual than what I expected for the place but was nice. One of us explicitly asked if one of the dishes contained peanuts due to an allergy. Waiter said he believed not but would double check in the kitchen. Brought the food with a funny comment: "I hope you are not allergic, allergic because the sauce has peanut sauce". She said she is allergic and would not eat it. The waiter had to run to the kitchen and we could hear the loud voices they had in there because they were closing the kitchen. She finally had her food once the rest of us had already finished. View was gorgeous but food did not impress. They were having issues in kitchen with staff. Clearly heard one of cooks on his phone threatening to quit. Our waitress was great and you can tell she was frustrated with kitchen. Took over an hour to get our food and none of our party of five enjoyed their meal as food was very bland. We waited over an hour for food. Everything was delicious. Scallops were good, and another shellfish medley called Seafood Norfolk was good. My husbands steak was excellent! They didn’t have the size he ordered but they gave him two smaller cuts which ended up being more than the original. One of our favorite restaurants! 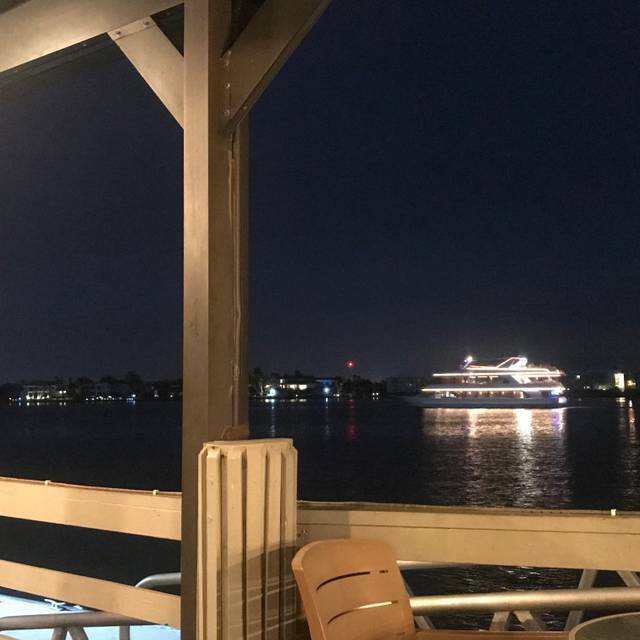 We were out for a late dinner on Saturday night while on vacation and thought we’d give The Boathouse a try, and we were very happy that we did. Service (Sarah) was top notch and the food was fantastic, portions were large. Overall atmosphere was low key and perfect for an enjoyable Saturday night out on the patio. Would highly recommend stopping here. Staff was very friendly, waitress was very knowledgeable to listing on menu which was helpful. Friendly and courteous. Pleasant dinner on the deck, but it was very hot and the umbrella did not shield us from the sun. Service took a long time due a busy evening. The waiter did his best and another server also assisted. I require a gluten free menu and did have several choices. I chose the shrimp, scallop and crab dish and it was tasty and generous but had more butter than I prefer. My husband had the filet and it was just ok. It is a pretty spot on the water and will remain on our list although we might make different choices of table and entree next time. The food was pretty good but the inside of the restaurant smells like a wet dog!! It was awful! I don’t understand. The carpet must be really old and nasty. Could not enjoy my food. Service was VERY slow and they were not busy. Our food was mediocre to poor. Our table offered no view. And our waiter quickly forgot about us and all our water glasses were drained and never even refilled. We’ve had better experiences here and brought guests. We were very disappointed and not likely to return in the foreseeable future. We loved our dinner at the boathouse. Atmosphere and food was delicious. Only one small inconsistency. The aperitif come after the appetizer. I will recommend the restaurant to my friends. Way to many people to serve so service was extremely slow. Even with a reservation we wait 30 minutes. Would like to have waited at the bar but it was packed and we couldn’t even reach in for a drink. Waitress was but overwhelmed. No tables outside for more than 4 (we were 5). Maybe I’ll try again outside of season. It can only get better! Slow service, took over an hour to prepare our meal for two, food was tasty. Small gluten free choice. Nice outdoor dining area with the water view, we had a nice table for two, chairs are hard for sitting a long time, needed cushions. Service was just good, not great, waitress was rushed, but we still waited a long time for our appetizers, salad, drinks and food! It was a special occasion night that didn’t go as we expected! There are many other better restaurants in Naples! We sat outside , which was lovely . Our server was very nice but it took so long to get our food. Overall we had a nice experience. Service was slow but he was very nice. I’d go back again. We thoroughly enjoyed our dinner at the Boathouse. The food was excellent and I can’t say enough about our server Allina. She was very efficient and personable. We would definitely request her the next time we dine there. This was our first trip back to the Boathouse in several months. My wife and I had the grilled seafood platter. It was fabulous. We took friends from Chicago and they loved the food, atmosphere and view. We will be back soon. Our dining experience was very pleasant. The meal was served steaming hot. Our waiter was very personable and attentive. I would definitely recommend this restaurant and we will return next season. The Boathouse is the perfect spot for those who love the water and eating some of the delicious food that comes from it! We had reservations and I had requested an outside table. The hostess abruptly told me that to accommodate 6, we would be sitting inside. Why was this not communicated to me when I made the reservation?? Hostess was not congenial, and that is the first time this has happened, as we have eaten here many times. Server was fine and the food was good, but it was ruined as we were sitting in the middle of the noisy dining room. Disappointed. My wife and I went for dinner after we received a recommendation. The decor is tiki bar and a bit tired but the waterfront view it excellent. My wife ordered a glass of wine but the glass had someone else’s lipstick on it. Then her salad was served with a piece of paper in it. We both ordered salmon but they were the slimmest pieces we ever saw. Literally the very tail end of a filet. Mine came in two very small pieces. They were tasty but skimpy. Other than the view we were disappointed. The manager did come over and apologized and comped us one desert. Maybe our expectations were high based on the recommendation but I doubt we’d ever return..
Nice selection and good prices. Batter on fried food fell apart but the fish and shrimp and oysters were still good. Had to remind our waitress a couple of times to bring things she had forgotten, but she did ok with everything else. I would recommend it but not rave about it as it was just ok, but good for the price and plenty of food. Sarah our waitress made our night!...She was amazing.We brought friends,and were very dissapointed that our reservation was not correct,as we had asked for outside dining,and the host said we pressed the wrong bottom....(really? )...young girls on the door eating popcorn and on their phones,could care less!....Sarah was running her fannny off with no support....hope you realize what you have in her. Our server got the initial order wrong and during the meal she mostly forgot our requests and it was necessary to ask a second time. Nice location and the food was ok but nothing special. It was great food. The service was awesome. Our waitress Linda was awesome and fun. Just the noise level is loud but it’s hard not to be. Our server was adorable and outstanding and the food delicious. Lovely view of Naples Bay! Always a pleasure dining here. Swordfish was yummy!! I updated my reservation to a party of 5 and a high chair. We were sat at a table fit for 4 Ana were very overcrowded the entire dinner. Our server, Ian, made it a lot of fun! Even when he got the sides wrong we were all laughing. He turned lemons into lemonade! Service was slow. Waiter was pleasant and tried hard but was new and not properly trained. He was clueless about gluten free options until he inquired of another employee who showed us both the markings on the menu. Sides ordered with meal never arrived even after we pointed it out to the waiter. Ambiance outside was pleasant. Our request thru open table for outside seating was not conveyed to the restaurant but they did accommodate us with outside seating. Food was good but not great. We had a really pleasant evening with a gorgeous view. Waitress was really helpful in guiding us with the fish choices. Food was hot and delicious...although I had a few unexpected bones in my Pompano. No big deal. Will definitely go back. Our favorite for food and Kerry’s service.